This Recently Seen in Area Collection has a collecting process with the shortest time period in my current Internet-based project. The process regarding the print media flyers was about the changes from the environmental conditions from the public realm. In addition, I viewed this project as an experiment for employing the Internet as a platform of presentation and the future growth of my methods with other collection themes. The ability to view visuals of the suburban roadways from Google Maps has offered variations with concepts concerning the element of time from a specific location. The selected visuals (video format) from my collecting process are one example that I embedded on the Google Maps webpage. 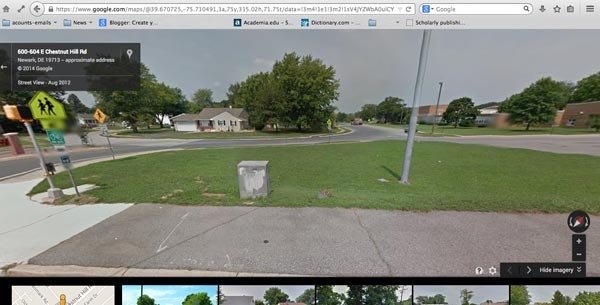 The other visual possibilities of the Newark, Delaware roadways are from Google Street View. With this option the viewer of the collection would have to take the initiative to search for the print media flyer location on the Google Street View webpage. This would enable the viewer to find the current state of that specific location. I have included a screen shot of the location at the NE corner of Route 4 and Brennen Drive that currently has located one of the Yellow, Black, and Red Print Media Flyers. This specific version of the Google Street View is from August of 2012, which is around the time of the first posting of the print media flyers. With my research from the “behind the scenes” of Google Street View, the current listing under the section, Where is Street View?, the southern counties of Kent and Sussex in the State of Delaware are being documented. I did not come across a specific time-period for updating the New Castle County area, which the town of Newark is located. These two web pages offer visuals, along with a different Internet-based perception of the Newark suburban environment. I considered the suburban environment as a collecting site, because of the approximate two-year time span with the posting of the print media flyers. But, I saw this collecting process as an experience to gain insight in observing a specific environment. Currently, the majority of my collecting process has been from a more controlled environment of a studio setting, which I restage the social interactions between people and objects. My fieldwork methods will be considered from this two-month time period to expand the Smell Collection that began in the Spring of 2014. This is significant for me to be able to expand the collecting process to a very diverse range of environments. http://www.google.com/maps/about/behind-the-scenes/streetview/ [Accessed: August 12, 2014]. Throughout the duration of my fieldwork with the video studies, I considered my presentation ideas for the digital media that would form the Recently Seen in Area Collection. I knew I wanted the video and digital still images to be viewed in a different manner, since this collection included the suburban environment. First, I considered my website as the main presentation platform for the collection. Working through the layout of the collection, I understood that I did not want the display of the collection to be separate from the plotted map location component. In this portion of the process, I began to edit the digital objects and acknowledge the visual redundancy of the suburban intersections. I chose the website, Google Maps, for the site’s options of being able to link video and digital images with the online map. This allows an interactive component of clicking on the plotted locations of the map and viewing selected video. The included screenshot shows the pop up style of presenting a video on Google Maps. The range of viewing time for the videos was between 30 and 45 seconds. This range of time came from my research of approximate time spent at a traffic light (averaging around 2 minutes) and my experience with the time to observe the four corners of an intersection while being stopped. In the organizing and digital curation of the collection, I did encounter Internet technology issues. These quirks altered the arrangement of the digital still image placement on Google Maps. My Internet technology issues had to do with uploading digital still images onto Google Maps. The video portion went smoothly by using YouTube as a host for my videos; the YouTube links were accepted immediately. I went through various Google-based sites to host my still images for the uploading process. They included Google+ pictures and Picasa. During my troubleshooting, I came across a blog that had great information and visuals. The post was over a year old and offered a link to an updated post with the up to date version of Google Maps (Maps Engine Lite). While the option’s that were offered to aid in embedding video and still images did not work for my situation, I found the comments listed at the bottom of the Mulin Blog very helpful. The comments stated the opposite of my current issue with still photos. Instead the responses referred to embedding YouTube videos. One commenter stated that Google Maps could be “seriously fickle” with embedding options. This led me to find a creative solution for embedding my still images. I placed the still images into a video format and applied my viewing time to each one. I uploaded these video versions onto my YouTube account and had no problems with embedding them on Google Maps to complete my presentation. The Recently Seen in Area Collection presented on Google Maps is not set in the preference as a “collaborative” map. This is intentionally done, because of the short time period of the project and to exhibit a specific time, along with the location of the existing state of these ephemeral objects, the print media flyers. After the first two weeks of plotting the locations of the flyers, I began the second phase of my fieldwork. This included collecting digital images of the locations and video studies for the actual collection. In the August 17, 2014 blog post, I presented my car as a means for travel, along with passive observation. My car didn’t impeded my visual methods for the collecting process it was the limited pedestrian accessibility to the intersection of roadways. While Newark does have sections of sidewalks, a majority of the flyers were posted in areas regarded as non-pedestrian accessible. I had to consider parking options for my car and walk to the intersection locations. Other instances, I had to recruit a driver for early morning weekends. These times were important, because of less traffic along the roadway to conduct video studies from the car at a slower pace. Thru this process of my fieldwork I was on guard of being exposed as a single person along side the roadway. My female gender is part of my concerns, but a larger portion is the cultural changes from the American 9/11 time period. Taking images along roadways or even larger public areas is still considered a suspicious act. I did not encounter any issues with this anti-terrorism system while out in the public realm. My minor disturbances during my fieldwork were a few outlandish remarks yelled out by people in passing vehicles. Navigating the suburban roadways for my visual methods has peaked my curiosity of how and when these print media flyers were posted in these specific locations. Please refer to the August 16th blog post Recently Seen in Area Video Studies for a couple approaches with how I was investigating the representation of the suburban environment. The suburban environment corresponds with the characteristics of print media as an object of communication. My sightings of the print media flyers have been in various suburban locations along major roadways in Newark, Delaware USA. The Newark roadways do have sidewalks for foot and bike travel, but the area is more motor vehicle oriented. The suburban environment is significant toward my introduction of the type of fieldwork I implemented for the collecting process of the Recently Seen in Area Collection. This second blog post for the Recently Seen in Area Collection depicts my fieldwork in a public suburban environment and using material culture methods in a collecting process. Within a two-year time period, I have passively observed the locations of the flyers, while being idle in my car at traffic lights. From this perspective, I observed the modification of four different styles of print media flyers and the alterations of them from the elements in the public realm. 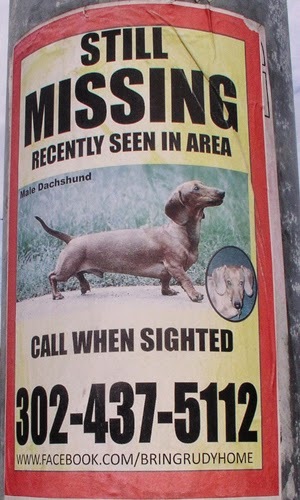 In addition, my view from my car influenced this short-term project to examine the flyers from an object perspective instead of the personal story of a person’s missing dog communicated from the flyers. My very first observations were the predominately red and yellow flyers with the inset image of a close-up of the lost dog’s face. Within the first year, there was a sparse posting of blue and yellow flyers. The 2014 harsh winter elements removed or faded the majority of the original style flyers. This spring is approximately the second year of seeing the print media flyer and a new yellow, black, and red flyer posted along the roadways. My sighting of this newest version of the flyer began the plotting of the locations. During the first two weeks of the collecting process, I began written field notes and expanded my observations by driving through the greater suburban areas of Newark. 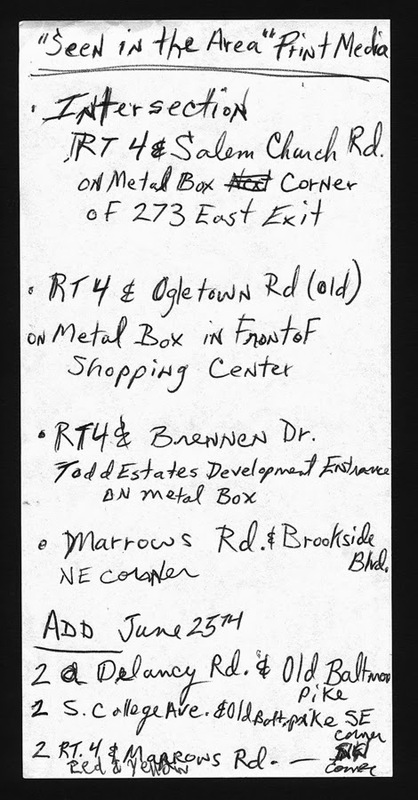 These written field notes were referenced and added to, as needed, during the entire 2 months of plotting of the locations of the flyers. My car was a means for travel, which enabled me to plot the locations of the print media flyers. In addition, the car is part of a broader concept of how the suburban environment is observed from the roadways. Since driving or riding in a car presents limited ability for a person to be physically interactive with the suburban environment, this arrangement connects with the main use of the human sense of sight acquainted with print media culture. Print culture is a passive or high information content mode of communication, which corresponds with the traffic flow on intersections of roadway. The use of the design elements of bold colors and block type for the print media flyers heighten the visual awareness, especially being posted on metal poles and metal traffic signal controller boxes. Observation from my car was one of the methods in my fieldwork for the collecting process of the Recently Seen in Area Collection. My weekly travels to the locations kept my notes current. This method contributed plotting the flyer locations in a timely process for the initial stages of the project, while scouting for parking locations to begin my video studies. I have taken my print media observation blog post theme and evolved the idea into a digital collection for my Internet-based collection project. This is the first of the August series of blog posts, which introduces the Recently Seen in Area Collection. The collection consists of plotted points of the locations of the print media flyers. The Internet-based collection is presented on Google Maps. 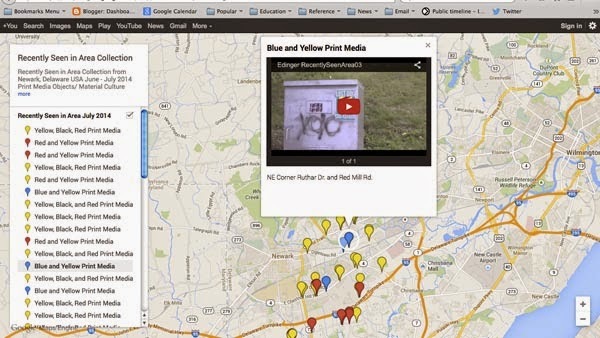 This map includes selected video of the locations and the four different styles of print media flyers. The Recently Seen in Area Collection is intended to exhibit a specific time and location of the existing state of these ephemeral objects.